In 2013, Captain Hannah Graf came out as a trans woman and became the highest ranking trans person in the British Army. Hannah has supported the army with updating its facilities and policies, including developing a new guide to gender identity. Alongside her work commitments, for five years she has been the trans representative for the Army’s LGBT forum. She has built a wide network of support and has become the leading voice of change for LGBT issues, achieving huge impact at all levels. She is also spokesperson for the Army Engagement Group and a mentor to others. 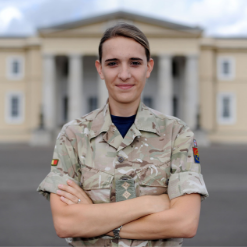 With a positive, inspirational message, Hannah has championed enormous culture change, removing barriers for trans people and moving the Army’s diversity agenda forward. Hannah is known for her openness and her willingness to support others, her dignity and her selflessness; she has been a trailblazer and has made a real impact in the Army and beyond.